Click here to read in text format. Click here to read in text format. Click here to read in text format. 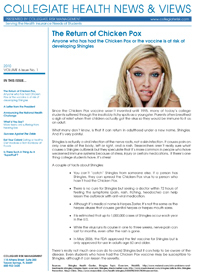 Since the Chicken Pox vaccine wasn’t invented until 1995, many of today’s college students suffered through the insatiably itchy spots as a youngster. Parents often breathed a sigh of relief when their children actually got the virus so they would be immune to it as an adult. READ MORE. Body modification refers to a handful of procedures that are designed to change the appearance of The United States is in a health crisis. According to statistics from the research firm NPD Group, about 62% of adults and 34% of children in America are overweight or obese. READ MORE. There is hardly a college student who doesn’t have an iPod, iPhone or MP3 player. So it’s not unusual to see a student sitting in the library or cafeteria, or walking on campus with headphones in their ears. Cool, handy and fun, but are these devices ruining their hearing? READ MORE. Collegiate Risk Management founder and president, Vonda White, has written a book entitled, Success Against the Odds, which will be released December 1, 2010. The book is filled with stories of many famous people who have overcome great odds to achieve success. READ MORE. It used to be, if you were “eating your greens,” you had a healthy diet. Turns out, nature had a plan for those other colored fruits and vegetables too. READ MORE. Is There Such a Thing as A 'SuperFruit'? Turn on the TV or open a magazine and you’ll likely see something on the health benefits of superfruits, which is fruit containing a high concentration of nutrients and antioxidants. READ MORE. 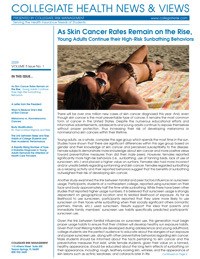 There will be over one million new cases of skin cancer diagnosed this year. And, even though skin cancer is the most preventable type of cancer, it remains the most common form of cancer in the United States. READ MORE. Body modification refers to a handful of procedures that are designed to change the appearance of the body and includes adornment, branding, coiffure, cosmetics, cutting, body piercing, scarification, and tattooing. READ MORE. Research conducted by the National Sleep Foundation reports that more than 40 percent of Americans have issues sleeping, mainly problems falling asleep or remaining asleep through the night. READ MORE. As the number of Americans who are overweight or obese continues to rise, so does the prevalence of Type 2 diabetes. Formerly referred to as adult-onset diabetes and noninsulin-dependent diabetes, further research has identified that unlike Type 1 diabetes, Type 2 can often be managed and even prevented with changes in eating habits and physical activity. READ MORE. 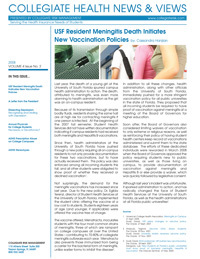 Last year, the death of a young girl at the University of South Florida spurred campus health administration to action. The death, attributed to meningitis, was even more alarming to health administration as the girl was an on-campus resident. READ MORE. The weight of financial burdens combined with an increasingly tough economic state is enough to make anyone stressed. Mounting credit card debt, a failing housing market, a sharp decline in job security, and rising gas prices are just a few of the challenges that could attribute to stress and/or depression. READ MORE. Annual Physicals for College Students: Necessary or Discretionary? Over the past several years, the necessity for annual physicals has been questioned by both health care providers and their patients. A recent study lead by the University Of Pittsburgh School Of Medicine found that up to 20% of American adults receive routine check-ups totaling an estimated $8 billion a year in unnecessary costs. READ MORE. The number of prescriptions for attention deficit hyperactivity disorder (ADHD) medications increased 369% to 23.4 million a year in the United States over a 10 year period, from 1992 to 2002, according to the National Center on Addiction and Substance Abuse Report. Included in the populations of patients who are visiting family physicians and specialists complaining of symptoms of ADHD are increasing amounts of adults and post-secondary students. READ MORE. Adults with ADHD may have symptoms that manifest themselves as socially inappropriate behaviors that are often attributed to other causes. People who are unfamiliar with the disease are likely to consider the inattentiveness, forgetfulness, and lack of impulse control that ADHD patients suffer from as rude, self-centered, irresponsible, and lazy. READ MORE.